Marble countertops are one of the most beautiful additions you can make to your home. While it’s easy to decide that marble will look great in your kitchen or bathroom, keeping it looking great through the years requires a bit more work. In today’s post, we’ll provide you with everything you need to know about marble cleaning in order to keep the marble in your home looking great in the years to come. Concrete & Marble Transformerz is Los Angeles’ Top Rated Local® marble restoration company—contact us today for a free estimate! Marble is a porous stone, meaning that it can absorb liquids if they’re left sitting for long enough. Sealing your marble adds a layer of protection between your marble and any liquids it may come into contact with. Your marble installation company should have provided you with an initial coating, but sealant only lasts around a year on average. One easy way to check the condition of your sealant is to pour a few drops of water on your countertops. If the marble doesn’t bead, it’s time to reseal. One of the most common mistakes homeowners make with their marble counter tops is using the wrong cleaning product. Acidic substances are marble’s worst enemy, so use only marble-approved, pH-neutral cleaning products on your counter tops. Use products intended for marble surfaces to avoid etching and clouding. Marble countertops will make your kitchen look elegant and sophisticated, but they require more diligence and mindfulness when it comes to maintenance. No matter what you’re cooking, it’s important that you always use a cutting board and clean up spills immediately. As we mentioned above, acidic substances are highly damaging to marble, so make sure that vinegar, citrus fruits, coffee, and wine are always handled with care around your marble countertops. Additionally, never place hot pots and pans directly on your marble. 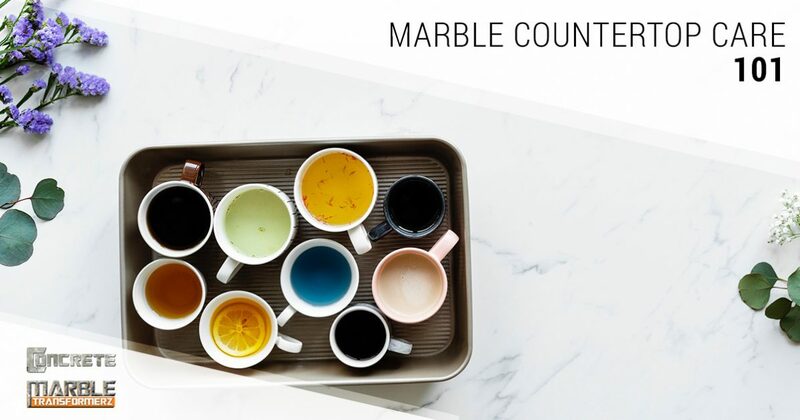 While it may seem obvious that you should never place scalding hot objects on your marble countertops, you should also be aware that coffee, tea, and other hot liquids have the potential to cause cracks and heat spots in your marble—use coasters whenever possible! 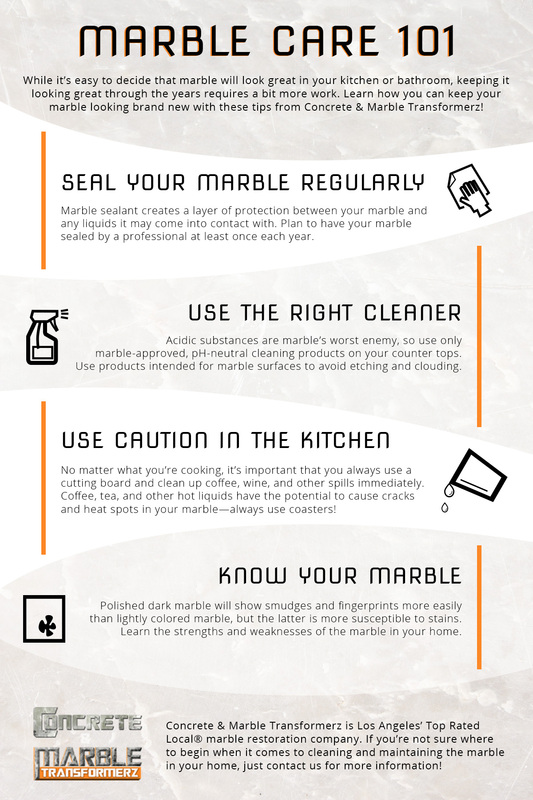 While the previous tips can be applied to any marble surface, it’s important to recognize the needs of the marble in your home. Think about the qualities of your counters—are they dark, or are they lighter in color? Polished dark marble will show fingerprints and smudges more easily than light marble, making it necessary to have a soft microfiber cloth on hand. Just as you should never use a dish towel to clean your glasses, you should never use a regular cloth to clean your marble countertops. If your marble is light in color, be extra cautious when cooking and handling liquids other than water. If you have young children or use your kitchen several times each day, you may want to invest in marble sealing every six months instead of every year. Concrete & Marble Transformerz is Los Angeles’ go-to resource for marble cleaning and marble restoration! If you’re not sure where to begin when it comes to marble cleaning, just contact a member of our staff for help. We offer free estimates, so don’t wait to protect your investment!